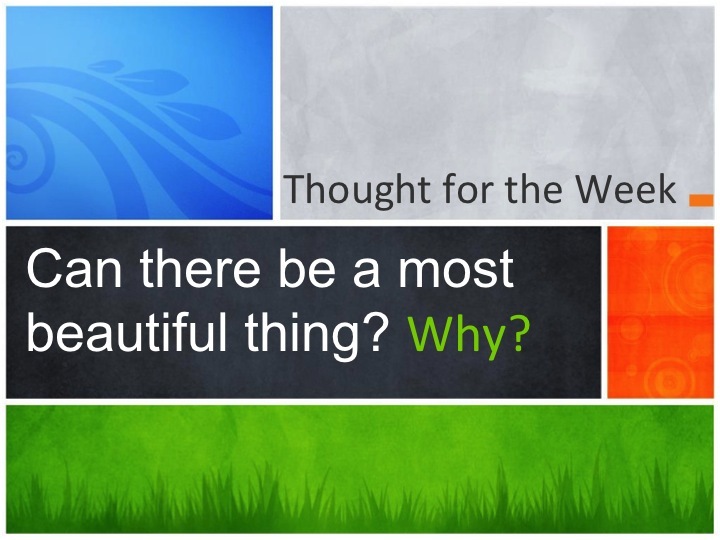 Thought for the week: Can there be a most beautiful thing? Next Post Mr McCormack’s on the run! It depends what things you like. So if someone likes roses and another person likes the climbing frame you can’t choose which one to like more. We believe that the most beautiful thing is everyone’s opinions, appearances, personality because everyone is different and has different looks and thoughts. I think yes because love is the most beautiful thing in the world because love brings people together. Yes the sunset! You get to make a wish when the sun goes down and it’s beautiful because it has so much light that you think it’s nature’s most beautiful thing. Yes a flower! Because it smells nice and looks nice. That is not possible because there might be a best-looking person, but every 60 seconds, a newborn baby is born. This means that this theory may be true, but only for 60 seconds. I think that its up to you and its what you think is the most beautiful thing in the world like one persons could be a flower and the others a video games everyone has there on opinions . No because if you see a rose and you say,that’s the most beautiful thing I’ve ever seen,the next few seconds you’ll see,another beautiful thing.